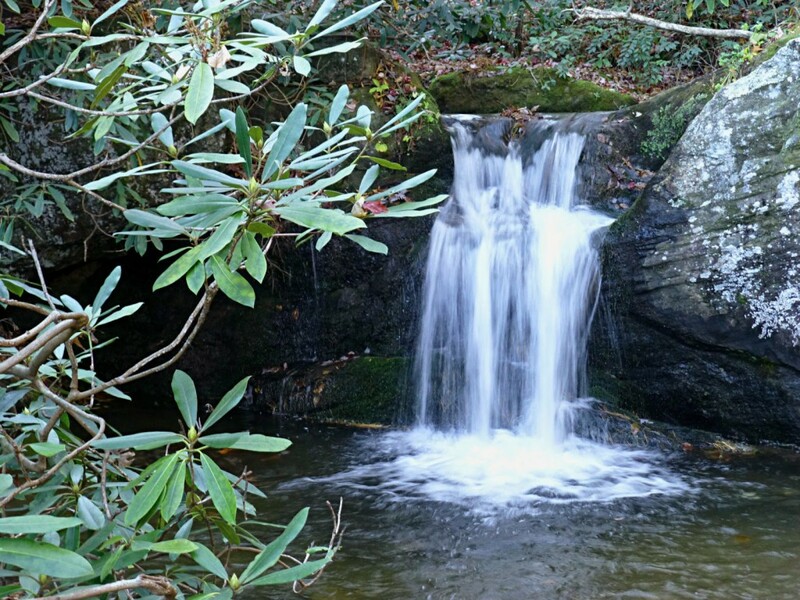 Looking for an easy hike to a waterfall when you come to our neck of the woods in western North Carolina? 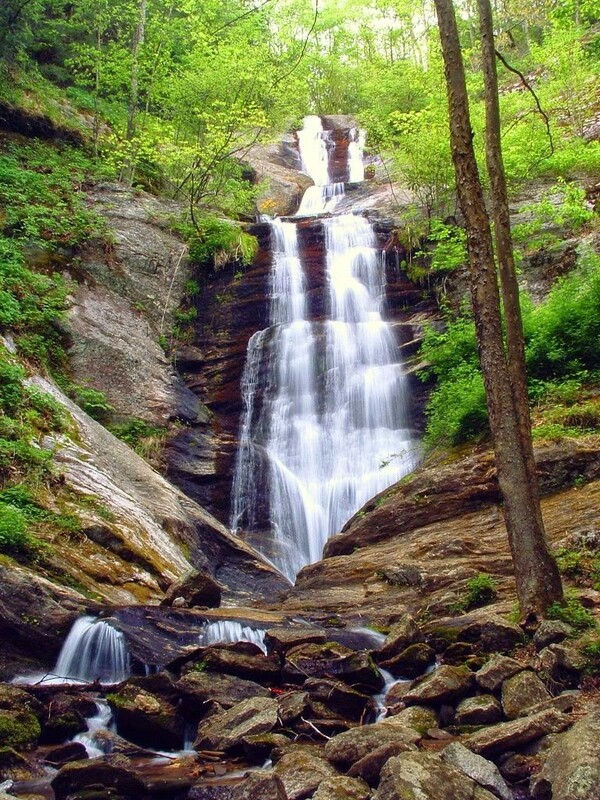 Look no further than Toms Creek Falls just north of Marion, North Carolina, in McDowell County. 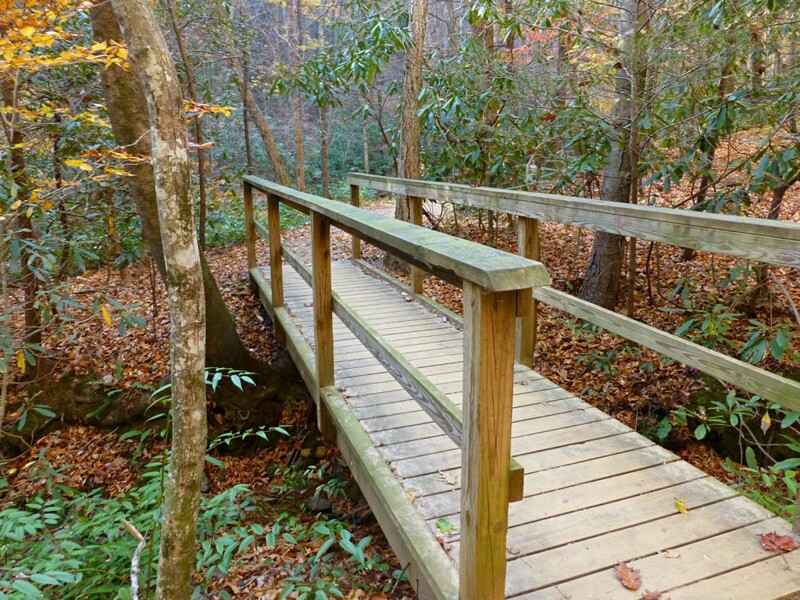 The trail starts by going over a short bridge and meanders along a nice creek, on a mostly flat forested trail. The trail is less than two miles round-trip (up and back) and leads to a waterfall that cascades 60+ feet down the rocks. If you head to the right from the base of the waterfall, you can access a trail that heads to the top of Toms Creek Falls. This trail is more moderate due to the incline (and watch that you don’t slip on the leaves if you’re hiking in late fall/winter. At the top, you can see the creek before it goes over the rocks and there is a “mini-falls” as well. 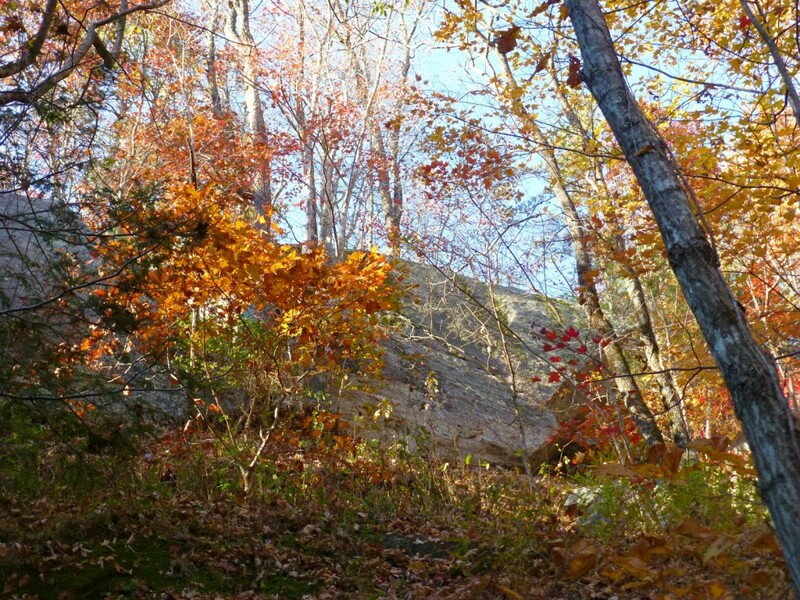 What also makes this hike interesting is that the waterfall is next to an old mica mine and there is mica in the various boulders along the trail and on the ground. There’s even a standing foundation for a water wheel used for the mine. The mine itself is accessed by crossing the creek near the base of the falls and then traveling downtstream just a short distance. The mine (flooded) is on the right, with rock walls towering dramatically skyward on either side. 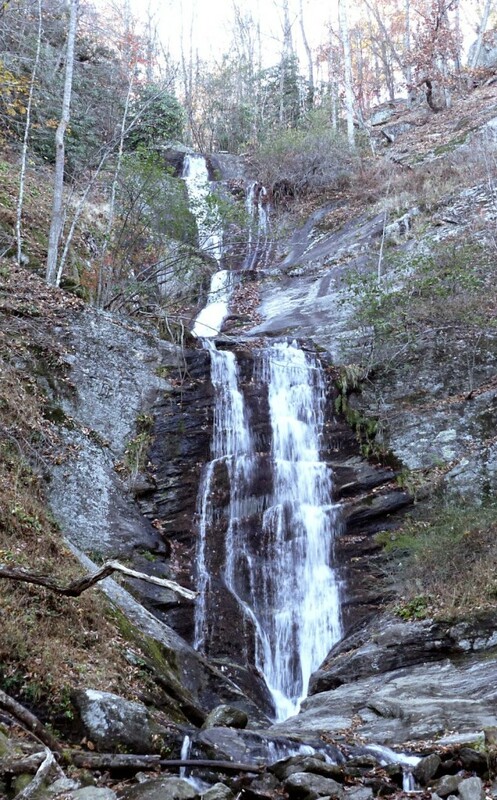 We put Toms Creek Falls on our all-season hiking trail list since the trail is well maintained and at a low elevation. It’s accessible in the wintertime (we’d love to see it with some snow as a backdrop), there are abundant wildflowers in the spring, plenty of shade in the summer, and a lot of trees that change color in the fall. We were fortunate to catch the last bits of fall color surrounding the large boulders when we were there with friends in mid-November. 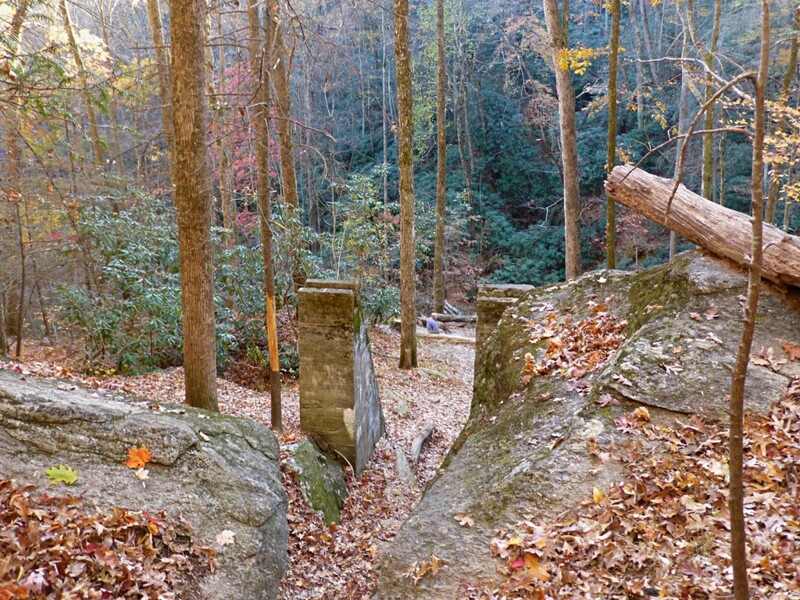 To reach the trailhead for Toms Creek Falls, from the Inn on Mill Creek, head into Old Fort via Mill Creek Road and Old US Hwy 70. Take Main Street/Hwy 70 east through Old Fort to Marion and then turn onto Hwy 221 North. Travel approximately 5.5 miles and turn left at the Woodlawn Hotel onto Huskins Branch Road. The road is a mix of pavement and gravel and you’ll see the parking lot with split rail fence and signage after about a mile. 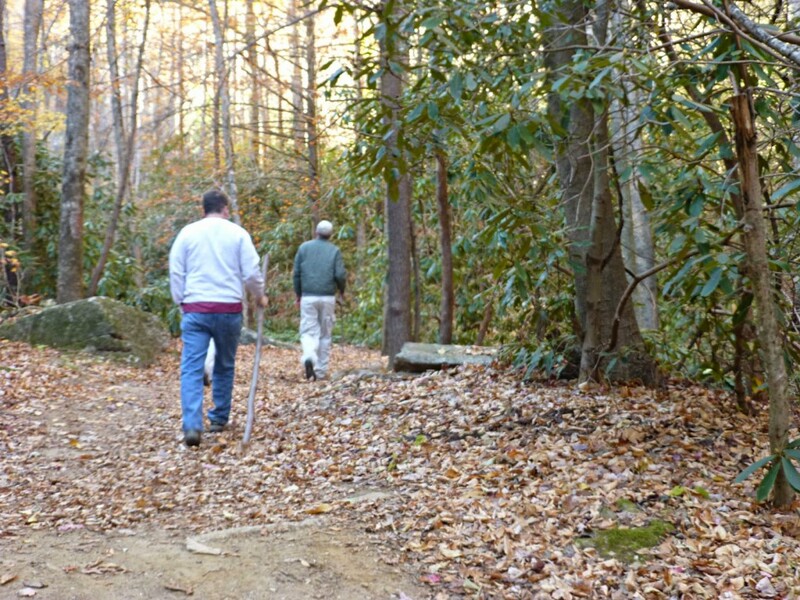 The trailhead is about 40 minutes from the Inn on Mill Creek B&B. This entry was posted in Hiking and Waterfall Trails and tagged hiking, outdoors, Toms Creek Falls, waterfall by Inn on Mill Creek. Bookmark the permalink.